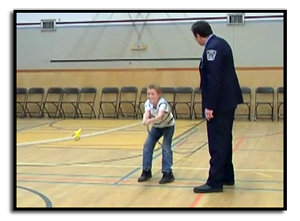 The Tug-of-Help, a 30-minute assembly involving all students in Grades 4 to 6, generally takes place in September or early October. In this interactive skit, community leaders use a rope pull to demonstrate the power of seeking help. The skit introduces students to the WITS LEADerS acronym and the idea of WITS Leaders – older students who can help younger students seek help from a responsible adult. Why is the Tug-of-Help important? The Tug-of-Help is the official launch of the WITS LEADerS Program and students’ first introduction to the LEADerS acronym. It’s an important assembly because it strengthens the connection between older students and community leaders, reinforcing that these people are still available to help just as they were in the students’ younger years. It also reinforces messages around why children should seek help when confronted with tough situations. In addition, the Tug-of-Help introduces the idea that children in Grades 4 to 6 can become WITS Leaders who are able to provide support to their younger peers and help make their schools and communities safer places for children to be and learn. How is the Tug-of-Help conducted? You should also select three WITS Leaders to participate in the skit in advance. These leaders should be students in Grade 5 or 6 who are familiar with the WITS Programs and can explain what it means to be a WITS Leader in the school. To prepare, lay out a long piece of rope on the floor and then pick an outgoing child volunteer from the audience. Ask for the child’s name and then explain quietly to him or her – ensuring the audience can’t hear you – that you are going to do two ropepulls between the child and the “bully.” In the first rope pull, the child will lose. The second time, however, he or she will win. Preparing the child for the outcome is important so that the sequence is fun and not upsetting to the child volunteer. Whisper to the child volunteer that in the first tug the audience may laugh, but that during the second round circumstances will change. 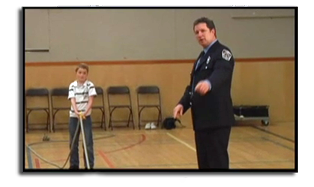 Because the audience may find it quite funny when the child volunteer initially loses the rope pull, it is important to prevent embarrassing him or her by facilitating comments from the audience. Begin by explaining that the rope on the floor is special because it represents the rights that every student has to feel safe at school. Tell the audience that you are going to demonstrate how a student can protect those rights. Introduce the child volunteer to the audience. Remember to also introduce your partner who will represent the “bully” in this skit. Explain that the “bully” in this case has decided to pick on the child volunteer because he or she is smaller than the “bully.” Explain that this means the “bully” is going to try to take away the child volunteer’s rights by teasing or scaring him or her. Ask the “bully” to grab one end of the rope and the child volunteer to grab the other. Encourage the child volunteer to pull as hard as he or she can in order to try to protect his or her rights. Despite the child volunteer’s efforts, the “bully” should be able to pull him or her effortlessly across the floor. Suggest that things might go better if the child volunteer had some help and then ask the audience if any of them might be willing to help defend the child volunteer’s rights. Select the three WITS Leaders from the audience. Ask them to explain their role as WITS Leaders and then direct them to get behind the child volunteer and grab the rope. Explain that there are others who can help as well and ask for some adult volunteers. Have the child volunteer and/or WITS Leaders select a mix of instructional and administrative school staff, parents or other community leaders in attendance. Ask each person to grab the rope behind the child volunteer. Repeat the rope pull. This time, the bully should be pulled effortlessly across the floor. Explain to the students that no matter how big a problem seems, when they seek help from older students and trusted adults, they can overcome it and protect their right to feel safe at school. Ask the audience what WITS stands for. If students have been through the WITS Primary Program, they should be familiar with the acronym. If not, they may need a little help. Explain that WITS stands for Walk away, Ignore, Talk it out and Seek help and represents strategies they can use when dealing with a conflict. Next, ask the audience what LEADerS stands for. Explain that the acronym stands for Look and listen, Explore points of view, Act, Did it work? and Seek help. Explain that these are skills they will learn in the WITS LEADerS Program and that they will use as WITS Leaders. Also, explain how you use LEADerS strategies in your work in the community. The Tug-of-Help ends with a reminder to students that you will be returning for school visits throughout the year to check up on how students are developing as WITS Leaders. What resources are available to help conduct the Tug-of-Help? The Tug-of-Help is meant to be fun and flexible and community leaders are invited to use their own personality to make it come alive. However, the WITS Programs have provided the following resources to help guide community leaders conducting the Tug-of-Help. 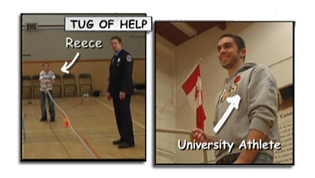 Tug-of-Help Video – Learn more about the Tug-of-Help by watching video of a Tug-of-Help conducted by firefighter Tom Woods. Tug-of-Help Script – For those who prefer, this script has been created to guide community leaders through the skit.